I have given and received my first few cards and it happened on the 29th November!! I'm not that organised usually with my cards; it's because my mum was meeting up with some of her closest friends prior to Christmas so we swapped to save posting. I always make my own cards, especially Christmas cards, and make them throughout the year, so I don't even have the excuse of "I haven't made them yet" for not writing them. I don't know what it is about writing cards, perhaps it's seeing so much of my own handwriting, perhaps it's that I would rather be making more (or even ironing) than sit writing them, perhaps it's because I am so used to a keyboard instead of ink that I start to ache after a few cards, who knows?! What I do know is that I am typing this blog post and I should be writing cards. I also keep a select few cards every year, because, well, you just never know..... By doing so, I still have the last Christmas (and birthday) card from my beloved Gran. Hi Lorraine **waves** Cards on the 29th wow! good idea to swap when seeing people though, I did an xmas pressie swap last week, its quite hard not to open them already, lol. Thanks for the comment on my blog, the first photo is in my back garden on xmas eve, the other 2 are on the way to my MILs in Telford, Shropshire, all from 2 years ago, its a lovely walk from our house, especially in the right weather. 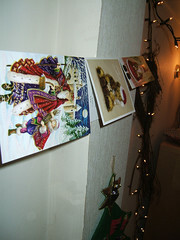 Love the idea of creating your Christmas cards throughout the year. I may have to take up that hobby myself! Lovely post!